I have a new horse for training, a mare named Belle. She is a Tennessee walking horse. She is a mare used to getting her own way, but she is also somewhat frightened of people and the strange things they do. Today I had an interesting training session with her. I brought her to the round pen. I had her in a halter and long lead rope. I began by just letting her know I enjoyed being with her. I then worked with her with the rope, which she has been afraid of the last few sessions. I calmly threw the rope towards her back and she jumped and moved away. I had no hold on the lead rope and I allowed her to move around as she liked. She to several trot steps around the pen, as she did this, I kept my shoulders parallel with her shoulders and would step sideways away from her. This caused her to stop and face me. I would then walk straight toward and tell her she was such a good girl. I threw the rope over her back again. Again, she took several trot steps, but was quick to turn and face me. The next time, she stood still while I threw the rope over her back. 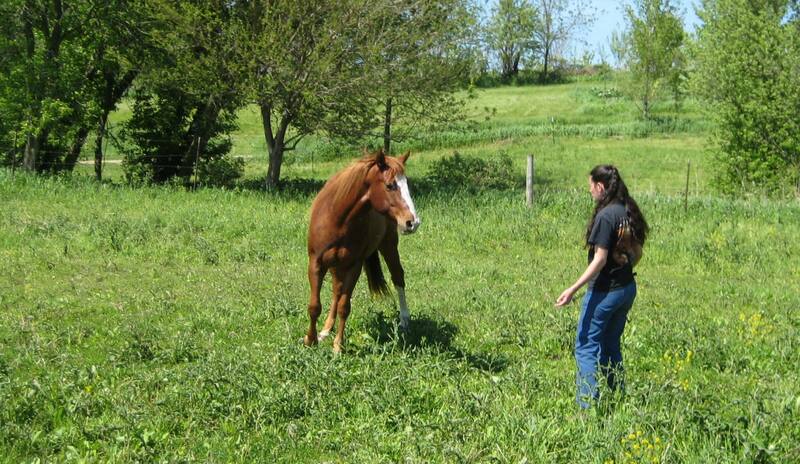 I then stroked her and then listened to the wind and focused on what was going on around me, not on the horse. This seems to help her. This allowing her to leave seemed to comfort her a bit. I didn’t chase her or have any “punishment” in mind when she left. The big thing I noticed was that as she was going around the round pen, if I faced my navel towards her and backed up, she had no interest in me at all; she wouldn’t look at me or turn towards me. If I turned so I was facing the direction she was traveling, she was much happier to face me and seemed to view that as an invitation to come in. It was a very enlightening day. Can’t wait to see her on Friday!